"I used this sauce on wings and they were super good." Combine chicken broth, brown sugar, honey, soy sauce, garlic, and ginger in a saucepan over medium heat; bring to a gentle boil. Reduce heat and simmer sauce, stirring often, until flavors combine, about 5 minutes. Whisk water and cornstarch together in a small bowl. Pour into the saucepan; simmer until sauce thickens, about 5 minutes. For a thinner sauce, skip step 2. Excellent!! Much better than store bought. I did use only water as I did not have chicken broth, and it was still amazing. Super easy and super good. I doubled the recipe and stored in Mason jars. Wicked on meat balls at a potluck. Great sauce as is! Have made it a few times now. this is better than anything you buy! I used it on spare ribs and poured some on rice. Delicious! 1.22.17 We found this sauce just a bit too sweet for our tastes, but admittedly, that could be personal taste preference. 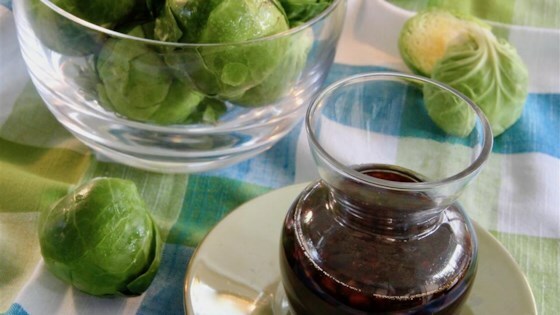 It added a nice touch to some simple steamed brussels sprouts.